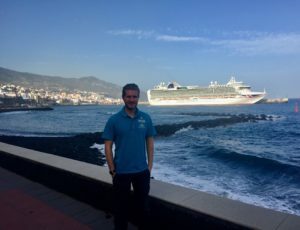 Join P&O Cruises Port Presenter Sam Whiteside as he shares the fifth instalment of his Arcadia world cruise diary. A beautiful start to the weekend was in store for us as we sailed serenely up to our anchorage position off our next country, Vietnam. The city of Nha Trang is a holiday haven and becoming more and more popular as new high rise hotels and luxury resorts are built all along its wonderful stretch of sheltered sandy beach. As our last tender port of the world cruise, a short run ashore brings you to the dock side, which is outside of the main drag, but a shuttle service provides easy access to the downtown and beach areas. First I visited the Po Nagar Cham Towers, located where the original Champa Kingdom was built up over 1500 years ago. The towers were built in 784 in red brick, built to honour the Lady Po Nagar, whom it is believed to be the founder of the Cham people. The complex is situated north of the main downtown area of Nha Trang. There are 3 main towers all with idols inside that are worshipped for various reasons. 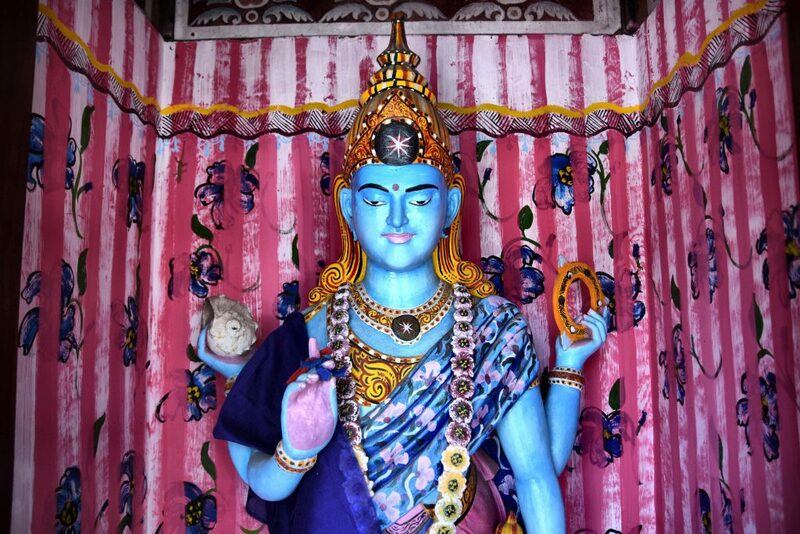 There are robes that you can wear to go inside the temples, or go dressed appropriately if you wish to enter. All around you are offerings of food and the smell of incense fills the air. The North Tower contains the most important idol at the towers, a black-stone statue of the goddess Uma with 10 arms, two of which are hidden under her vest; she is seated and leaning back against a monstrous beast. From the elevated position of Po Nagar it is also possible to see the second important religious site and the next stop on our tour, the Long Son Pagoda. 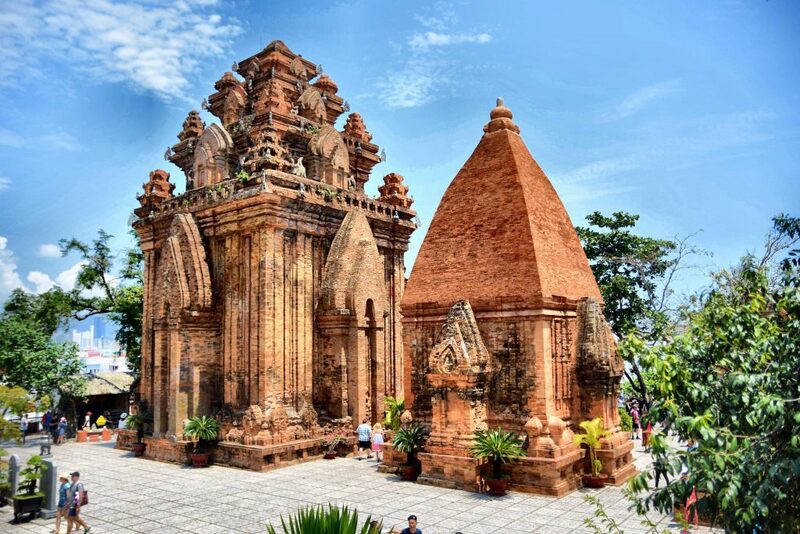 The Buddhist place of worship was first constructed in 1886, but a cyclone in 1900 destroyed the original temple and a new one was built in its current location and is now the headquarters of the Buddhist Association of the Khánh Hòa Province which Nha Trang is capital of. 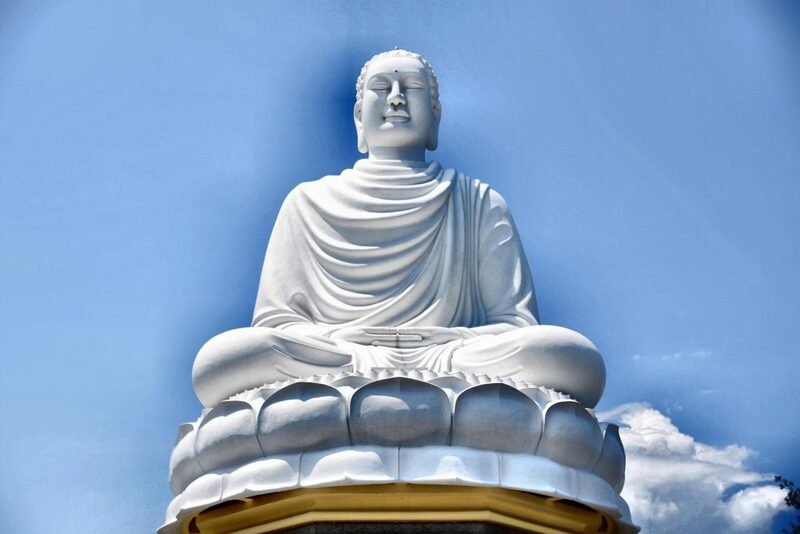 The main attraction for tourists here is situated above the temple grounds, accessed by 152 stone steps, and that is the gleaming white concrete statue of Gautama Buddha. From the ground up, the statue is 24 m, and from the base of the statue, it is 21 m. The figure of the Buddha is 14 m while the lotus blossom comprises 7 m and looks out over Nha Trang, again with magnificent views. 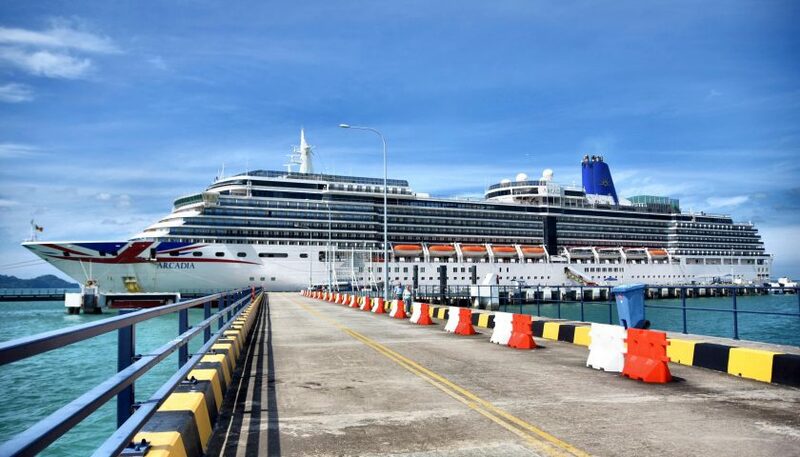 These two sites are well worth the visit in Nha Trang and only occupy a short amount of the day, still allowing you to appreciate the central areas of town which are anchored around the Cho Dam Market, or heading down the glorious beach, which has ample dining and leisure areas for you to enjoy. 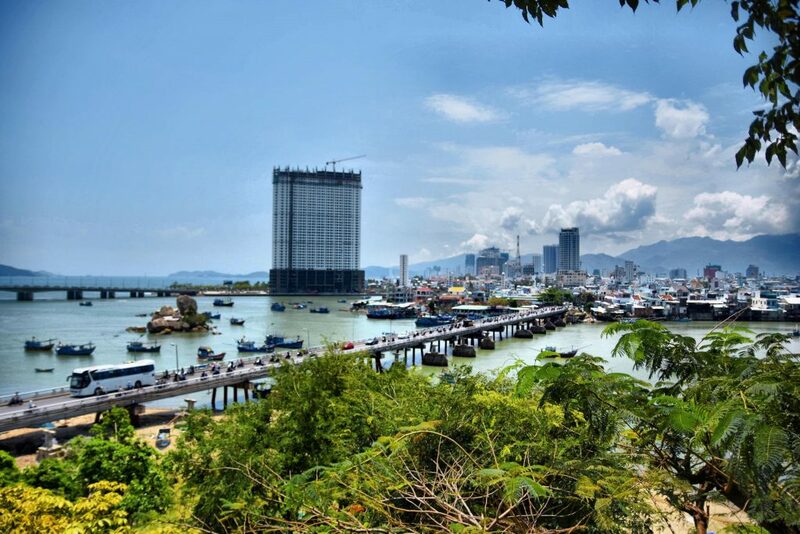 Phu My is one of those ports that we call in the business a ‘gateway port,’ due to its geographical proximity to amazing areas of history, culture and beauty. 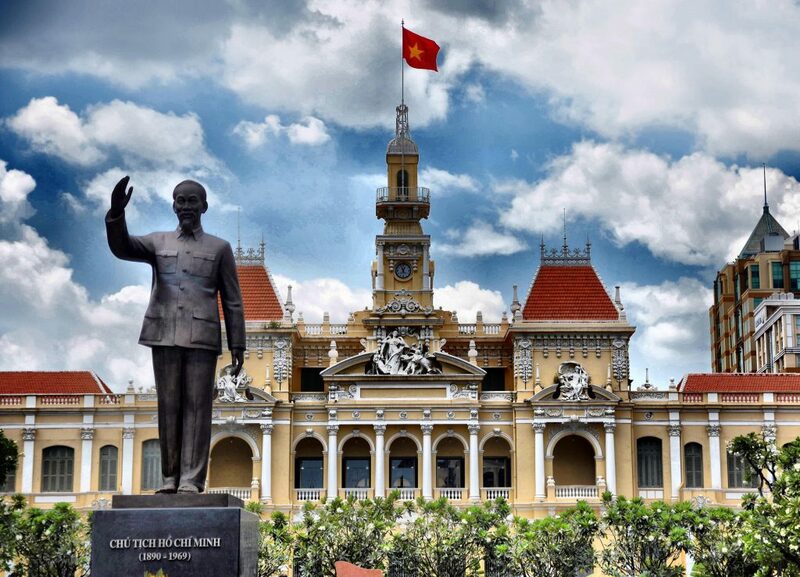 Phu My is the access point for a fascinating look at Vietnam’s recent history with the main excursions focusing on the former Saigon, now more commonly referred to as Ho Chi Minh City, the largest city in Vietnam. The distance to Ho Chi Minh from Phu My port is around 1 ½ hours on the new expressway. I had only briefly stopped in Ho Chi Minh City once before. A drive through had given me the desire to return and see more of a city that exudes European sophistication in its architecture, with the hectic appeal of a South Asia sprawling metropolis. 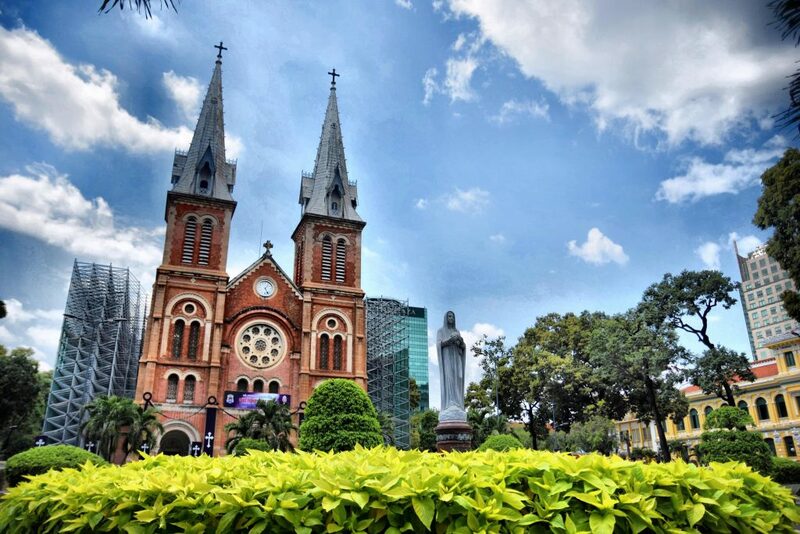 A lot of excursions head up to Ho Chi Minh City from Phy My and you can do guided or unguided, with my preference being the unguided version which allows you the freedom and flexibility to plan your time around your needs. The thing about Ho Chi Minh City is that everything is conveniently located within the central districts, namely district 1 (as the city is organised in a numerical plan), and so it is very simple to explore and navigate on foot. With the city expanding so rapidly there are a lot of works ongoing, including the development of the first metro system in Vietnam which will revolutionise public transport in the city and hopefully decongest it, as you will find that the roads are choc-a-block with motorbikes and scooters weaving in and out of cars, buses and trucks a plenty. This visit was only fleeting, with around 4 hours in the city to explore, but Grace and I managed to cover the main sites we wanted to see externally, including City Hall on Nguyen Hue Street, built between 1902 and 1908 in French Colonial style. We also stopped at the Notre Dame Basilica, which is currently undergoing much needed repairs to its roof and exterior walls, which is not surprising considering all the bricks used in its construction between 1863 and 1880 were imported from the area around Marseille in France. In front of the Basilica is a statue of Our Lady of Peace which came from Rome in 1959; made of granite and unveiled on 16thFebruary that year, the statue is said to have shed tears in October 2005, creating large crowds of people who wanted to witness the ‘miracle.’ Our final external visit was a quick photo stop at Independence Palace, also known as Reunification Palace, built from 1962 to 1966 after the original palace was destroyed in a bombing raid by two rebelling Vietnamese Air Force pilots. Following our short history tour around, we ate noodles at a local restaurant next to the Ben Thanh Market, the main touristic shopping location in the city. To be honest, most if not all the products inside the covered market are touristic tat as I would call it, but you can get a good bargain here on lacquer boxes or tea sets, depending on what takes your fancy. If you want to try a bit of bargaining then this is the place to do it, just be mindful of the crowds and the potential for pick pockets as it gets very busy and it can be easy to get caught up in the excitement of getting a good deal and not paying attention to your personal items; luckily we did not fall into that trap on this occasion, and made out with just the customary fridge magnet in hand. Two very nice days spent again for me in Vietnam and I really do now need to come back for longer to explore more of this burgeoning Asian power. One of the reasons I find this leg of the world cruise so enjoyable is because it’s the only real time when you have consecutive port days to contrasting destinations. For the most part there are usually long periods of sea days followed by a single port day, then more sea days until the next location. 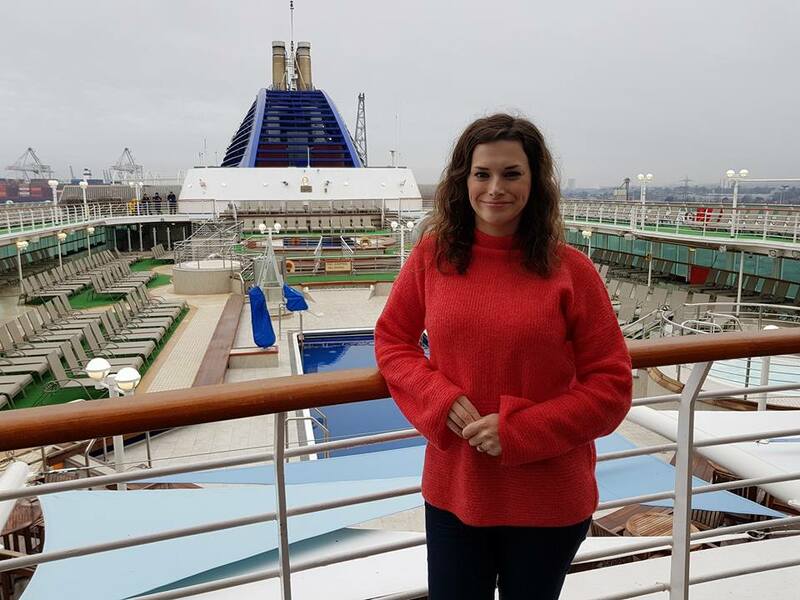 This is great for R&R time don’t get me wrong, but for someone like me who is an explorer, there are only so many times I can walk around the promenade deck before I start craving more space. 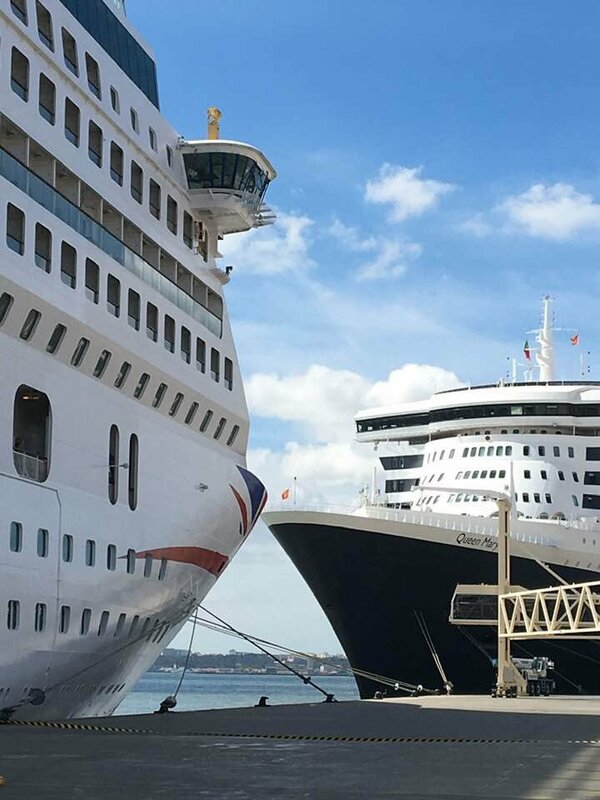 If you are someone who wants lots of port days as part of world cruise, but don’t want to or can’t take the time to do a full voyage, then look at itineraries that cover South East Asia. Our next overnight destination, and my favourite of this particular leg, was Singapore, the Lion City. 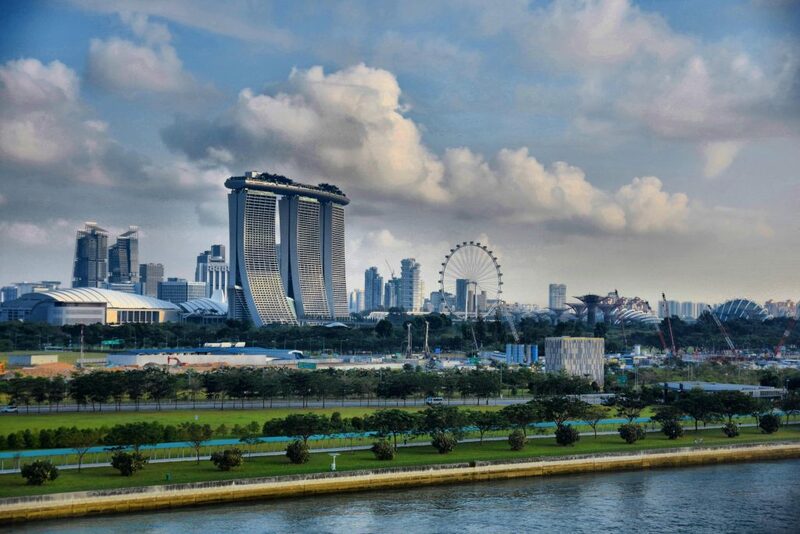 Singapore has a fascinating history, which today it blends magnificently with its modern and futuristic expansion. Located at the southern end of the Malay Peninsula (its name in Malay, Pulau Ujong, means ‘island at the end’), Singapore is made up of one main island (also called Pulau Ujong) as well as 62 other islets, spread over an area that is half the size of London and home to some 5.5 million people. Over two days it is easy to explore much of what Singapore has to offer and I cannot rave about it enough. Having an overnight stay is truly magical for many reasons, but first off, a day of thrills and spills at one of the islets of the nation, Sentosa. 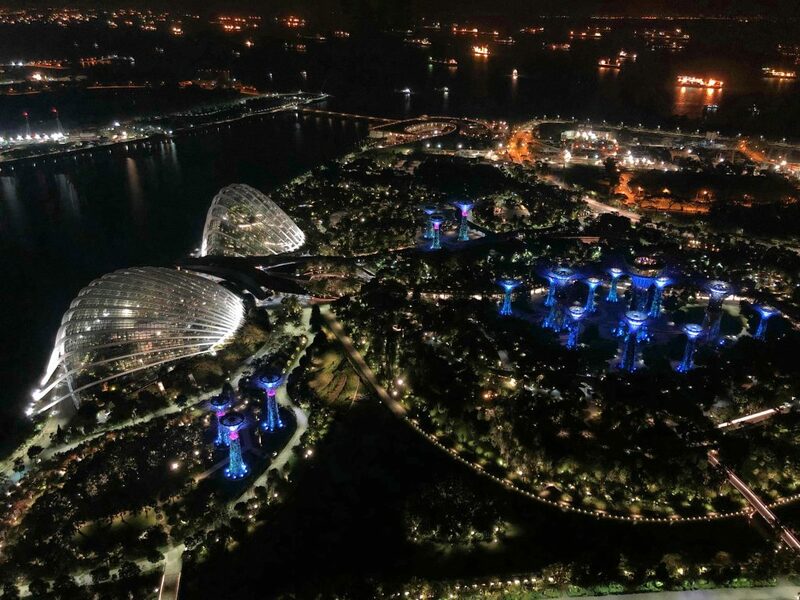 If you ever hear people mention Sentosa when you go to Singapore, it is really an area for pure leisure activities, being the location of the main beaches, casino, waterpark and hotel resorts. Today was a chance to find my inner child with a visit to Universal Studios Singapore at Sentosa. Getting to Sentosa can be done in several ways, with Singapore having a very good public transport network of buses and a metro, but we opted for a taxi for convenience and to get us there quickly, as it is only a short 15 minute taxi ride away. 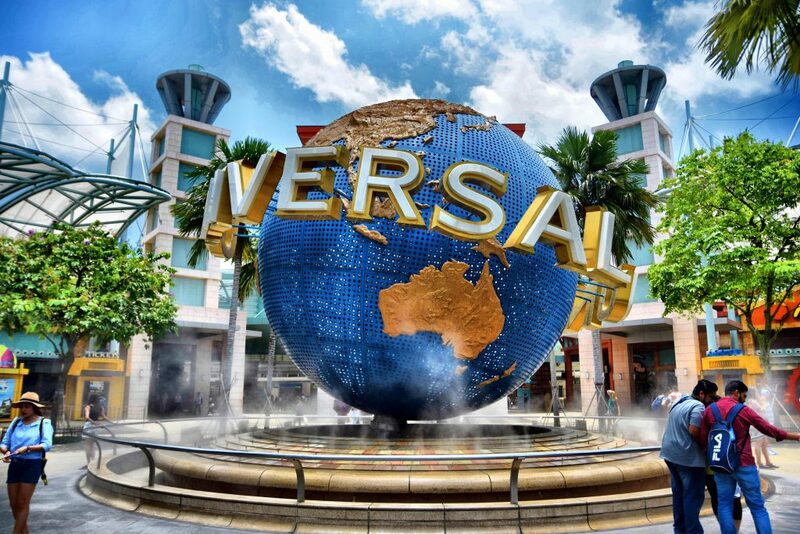 On arrival at Sentosa it straight away feels like a theme park, as you are surrounded by shops and food outlets, with the famous Universal Studios globe almost hovering in middle of all the activity. Like any theme park, Universal Studios has different themed areas based around the movies, such as Madagascar and Shrek for the young ones, to Jurassic Park and The Mummy for people who want a bit of a fright. There was a fantastic action and stunt show themed around Waterworld, as well as a Steven Spielberg inspired action show. Highlights for me though were riding the world’s tallest pair of duelling coasters, Human and Cylon, from the Battlestar Galactica universe, and the Transformers 4-D motion ride, where you are part of the task force escaping Megatron, supported by Optimus Prime and Bumblebee. Overnights in port are obviously very sought after by all on board to provide extra time for sightseeing and the opportunity to explore when the sun goes down and the city lights come up. Singapore offers a vibrant nightlife, which does not have to be all about partying. A must do if you are staying overnight is head to Gardens by the Bay. During the daytime it is beautiful to wander through all the fields and open spaces, to visit inside the Flower Dome and Cloud Forest, which are futuristic greenhouses sheltering an abundance of colour and awe inspiring beauty. At night you can wander through the park area and the place to be is the Supertree Grove. 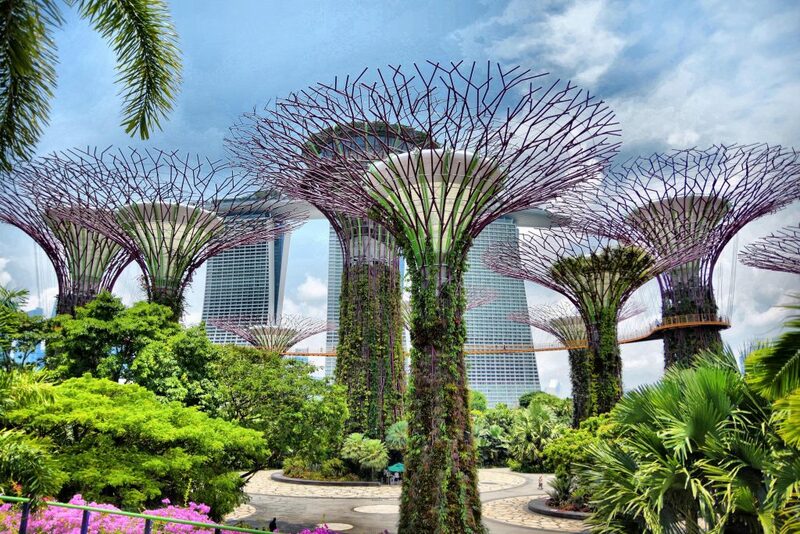 The Supertrees are tree-like structures that dominate the Gardens’ landscape wih heights that range between 25 metres (82 ft) and 50 metres (160 ft). The trees are truly spectacular, and by night they become the centre of attention, as at 7:45PM and 8:45PM daily, they are host to the Garden Rhapsody show, where the trees come alive with dazzling lights and accompanied by music, which changes themes on a regular basis. As it was the first time to Singapore for my girlfriend Grace, I wanted to take her out for the evening. We took a short taxi from the ship to the gardens to watch the show, but you can easily walk there from the cruise terminal in around 30 minutes (however it was still way above 30 degrees for the 8:45PM show). The musical theme for the evening was music from movies. People stood around taking photos and videoing the proceedings, with some even bringing blankets to sit on the floor and watch. The main part of the evening was dinner out and there are plenty of places to go, whether you want to try out the street food at Bugis Street Night Market or Chinatown, or sample the plethora of restaurants at either Boat Quay or Clarke Quay along the Singapore River. However if you really want to dine in style, then I would book a table at one of the rooftop restaurants of Marina Bay Sands Hotel. Marina Bay Sands is the icon of Singapore and has been featured in numerous documentaries about the world’s most prestigious hotels, with its three 55 storey towers topped by the a 340-metre-long (1,120 ft) SkyPark with a capacity of 3,900 people and a 150 m (490 ft) infinity swimming pool, set on top of the world’s largest public cantilevered platform, which overhangs the north tower by 67 m (220 ft). You have to be a guest at the hotel to be able to use the pool, and before you think about booking a room between you and the whole of your dining table, be warned that the pool is accessed by your room key card, of which you only receive two per room! 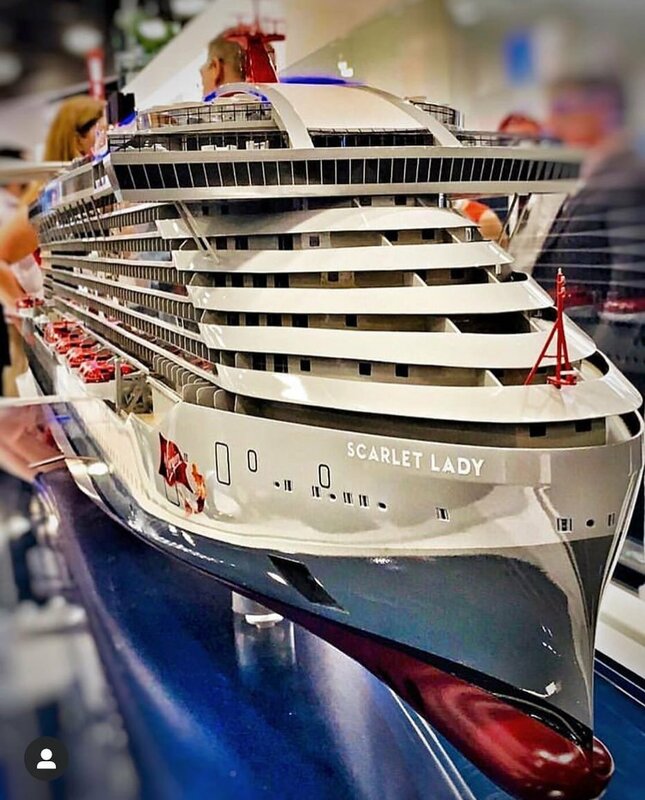 I was fortunate enough to stay at Marina Bay Sands as a guest last year when I disembarked Arcadia, however the prices are a bit eye watering for a one night stay at around £300 per room, but if you fancy one night away from the ship on your world cruise, then Singapore could tempt you with the opportunity for that much sought after selfie! This time though I wasn’t staying at the hotel, but dining at the fantastic Spago by Wolfgang Puck, before heading over to C’est La Vie, the fantastic roof top bar that overlooks Marina Bay and the skyline of downtown Singapore. Grace and I had a wonderful evening, with delicious food starting with a Gratin of Royal Oysters and Big Eye Tuna Tartare Cones, followed by Pan Roasted Snapper Laksa for me (a traditional Malay dish recommended by the waiter) and Smoked Maple Leaf Farms Duck Breast for Grace. After our shared dessert of a Salted Caramel Souffle, we ventured across the root top to C’est La Vie for a cocktail, which of course being in Singapore was the famous Singapore Sling. It was a great night with great company, food and views and led into our second exciting day in Singapore perfectly. No rest for the wicked they say and if you want to cram in as much exploring as possible you do have to play hard and work hard. That meant being up bright and early to venture on a fantastic excursion we offer. 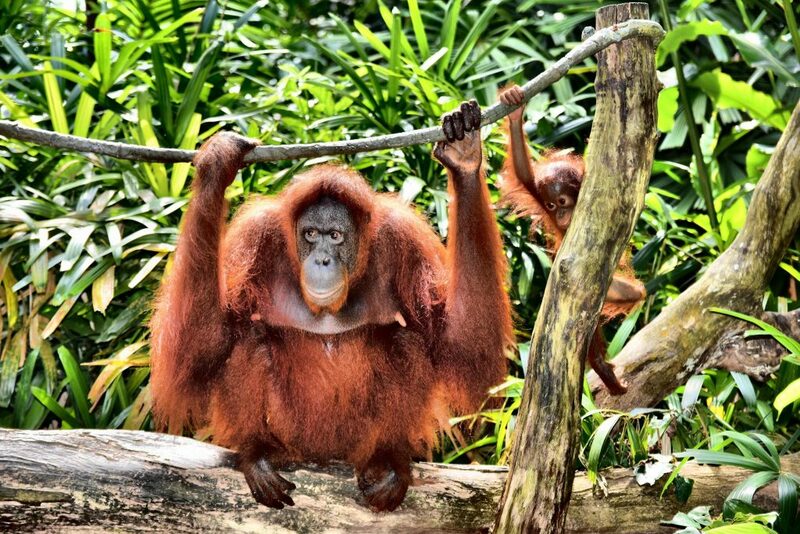 Breakfast In the Wild is our P&O Cruises excursion that takes you for a half day visit to Singapore Zoo, one of the most popular attractions in the country, to have a breakfast buffet alongside the zoo’s Orangutan colony. The breakfast service is fantastic, with tables set up in rows surrounded by the buffet choices ranging from eggs and bacon, to more regional options of curry and noodles. Whilst you are sat tucking into your meal, the park attendants and zoo keepers prepare the demonstration area for the arrival of the Orangutan family, as they slowly make their way down from the tree canopy above the restaurant to have their own breakfast. You can hear the ripple of excitement as people start to notice the Orangutans arriving at the specially set up podium. The zoo keepers provide a commentary over the PA system in the restaurant which is great as it explains all about the Orangutans whilst you can relax and finish your breakfast before the zoo keepers invite everyone who wishes to head up and line up to have photos. The zoo have no problem with people taking as many of their own photos as possible and also will take your camera for to take group shots if you need, but they also provide professional photographers should you wish to use them. After you have had breakfast you are free to explore the rest of Singapore Zoo, and you also have complimentary tickets for the ride on tram around the zoo if you don’t fancy the walk. The zoo itself is an open zoo concept, so animals are organised in various zones with open habitats, rather than being caged in. This creates a nice atmosphere and you can get close to many different species including firm favourites like giraffes, zebras, elephants and lions. As this is only a half day tour, it still provides time for more sightseeing and I took the opportunity to go solo in the afternoon and walk in from the cruise ship terminal to Gardens by the Bay. I walked for miles retracing my steps from previous visits. I had a nice walk back along the river opposite Boat Quay, where the famous bum boats pass up and down on their little river tours, to view the original Merlion Statue, the personification of Singapore and a national icon. There was even enough time for a quick visit to the shops at Marina Bay Sands before hopping in an Uber back to the cruise terminal after two jam packed and memorable days in The Lion City. I told you the days were coming thick and fast in this leg and why I enjoy it so much. Just like Phu My in Vietnam, Port Kelang is a gateway to major sights and attractions in this region of Malaysia, mostly to visit the delights of the capital city, Kuala Lumpur. This was my first visit to Malaysia so I was very excited to tick off a new country and visit its main touristic hub. 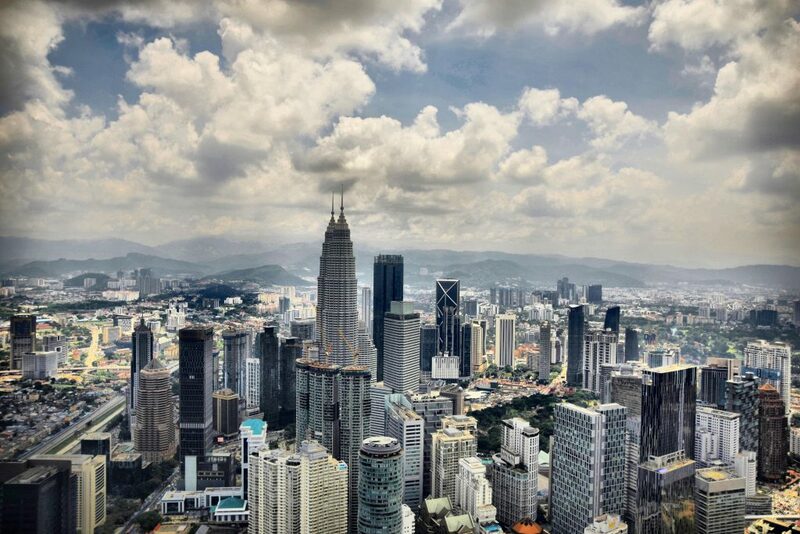 I picked a good introductory excursion, the Best if Kuala Lumpur, as I felt what it would allow me to appreciate the city without actually doing too much. 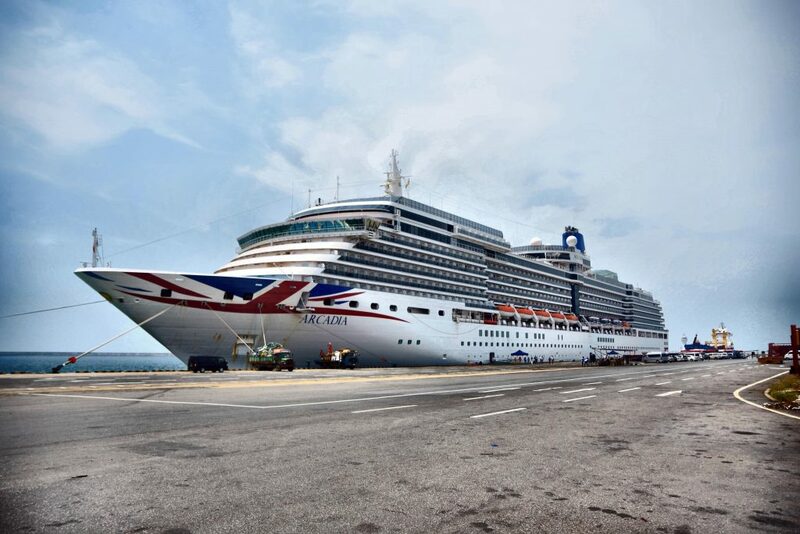 The journey to Kuala Lumpur from Port Kelang takes on average 1 ½ hours. The first stop was at the National Museum showcases Malaysian history from its geological formation, through to its national identity today. The visit was only brief, but gave me an understanding of the diversity of this country. 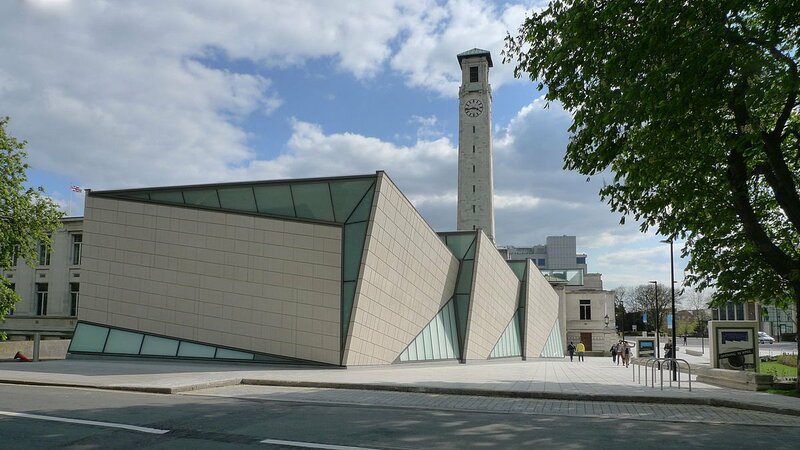 The second stop was at the former central railway station building, before walking to the National Mosque, with its design incorporating the umbrella as symbolism, including the 73m high minaret as a folded umbrella and the blue tiled concrete main roof as an open one. From here we drove the short distance to Merdeka Square, literally Independence Square, the location where the flag of Malaysia was raised for the first time. Our next stop was a brief photo stop at an icon of global architecture and really the symbol of modern Kuala Lumpur and Malaysia. The Petronas Twin Towers were the tallest buildings in the world from 1998 to 2004 and remain the tallest twin towers in the world. 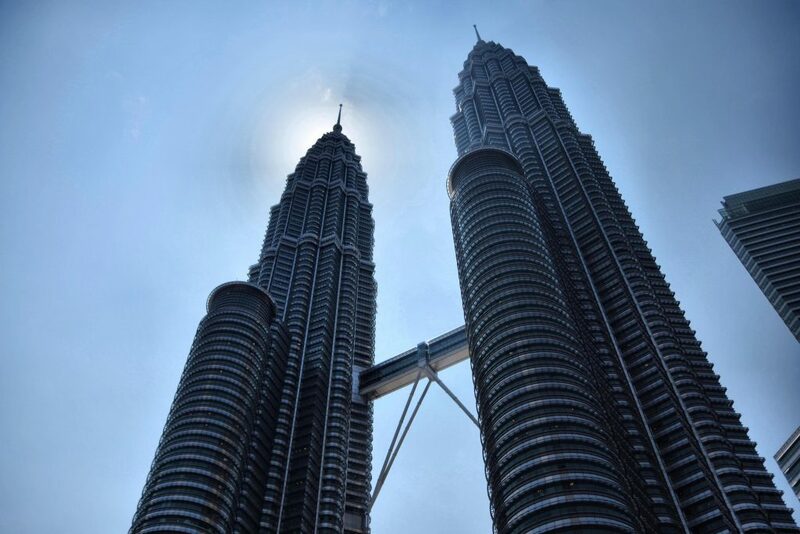 Soaring to a height of 451.9 metres, the 88-storey twin structure is Kuala Lumpur’s crown jewel and was designed in collaboration with forward thinking Prime Minister Tun Mahathir Mohamad to propel Malaysia into the modern world. The towers feature a double decker skybridge connecting the two towers on the 41st and 42nd floors, which is the highest 2-story bridge in the world. It is not attached to the main structure, but is instead designed to slide in and out of the towers to prevent it from breaking, as the towers sway several feet in towards and away from each other during high winds. Most people had wanted to go up the towers, and our excursion to do this was fully subscribed. The final stop before our included lunch was a visit to the observation deck of the KL Tower, which is just across the city from the Petronas Towers, with unrivaled views of the building, plus the city and surrounding areas. 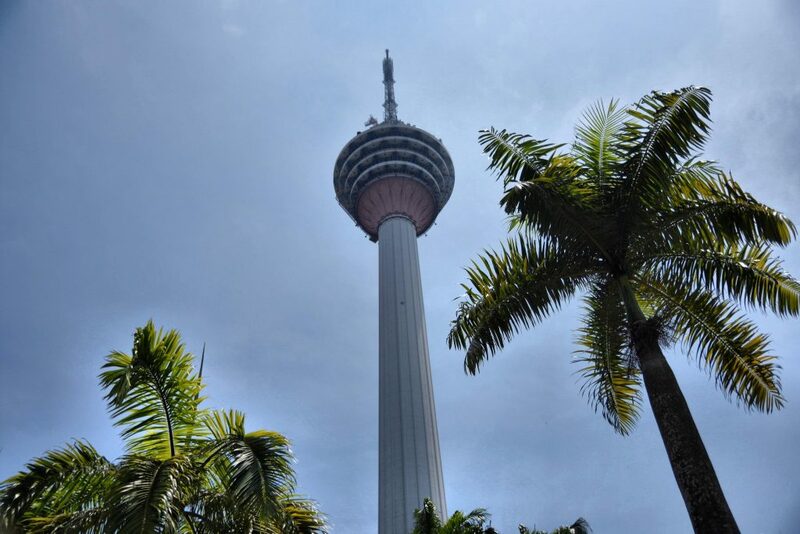 The KL Tower actually predates the Petronas Towers, being built concurrently to them but opening in 1995. It is currently the 7thtallest freestanding tower in the world at 421m high. Its observation deck offers 360 panoramic views, the highest observation deck in the city. With all this sightseeing we had built up an appetite and so this option is also good as includes lunch at a local hotel, which was well laid out and buffet style meaning the flexibility to get your own food and have as much or as little as you desire. The traditional Malaysian cakes were also a great treat, and I think I had more of them than I did main course. 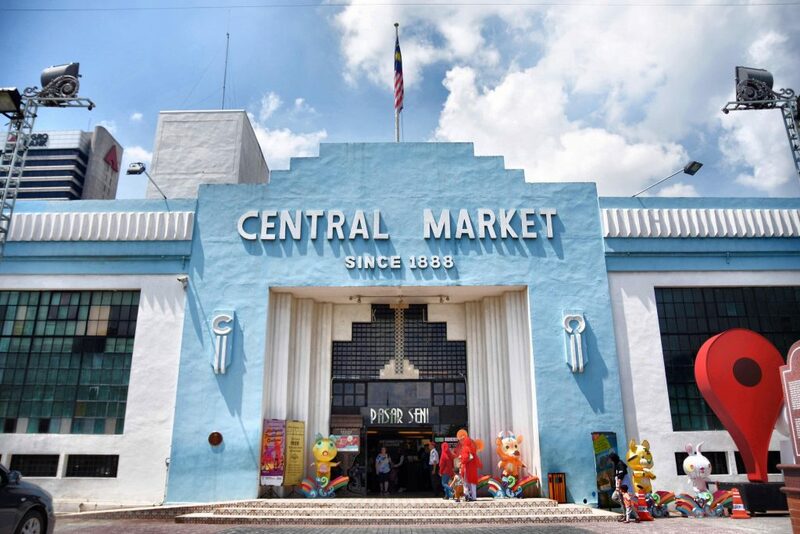 After lunch the final stop of our day to KL was at the Central Market for some free time for browsing the various shops inside the beautifully iconic 1920s art deco covered arcade. 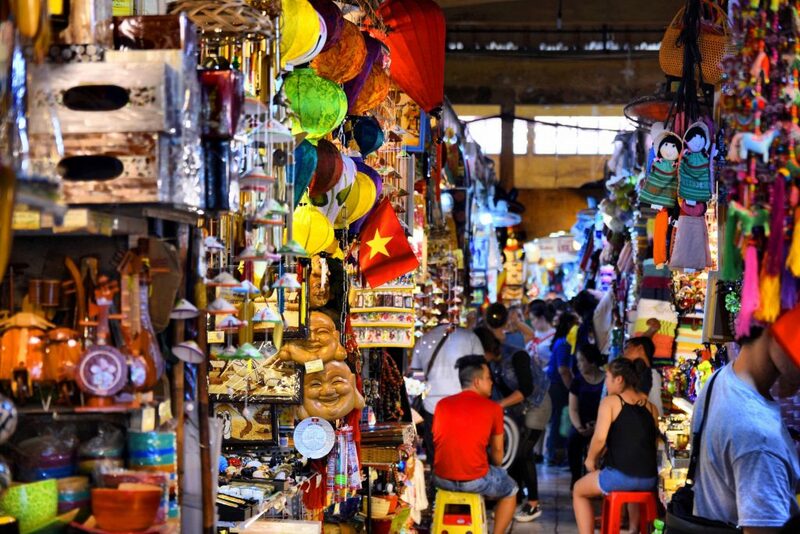 This market has a variety of arts and crafts to a very high standard, lovely local silks and garments, herbal tea and coffee shops, along with more convenience based shops selling electrical items and everyday essentials. I was very pleased with my choice of sightseeing for the day in Port Kelang and very impressed with my guide and Kuala Lumpur in general. Our two consecutive days in Malaysia were like the mirror image of our two consecutive days in Vietnam, with Langkawi being a touristic beach destination just like Nha Trang. 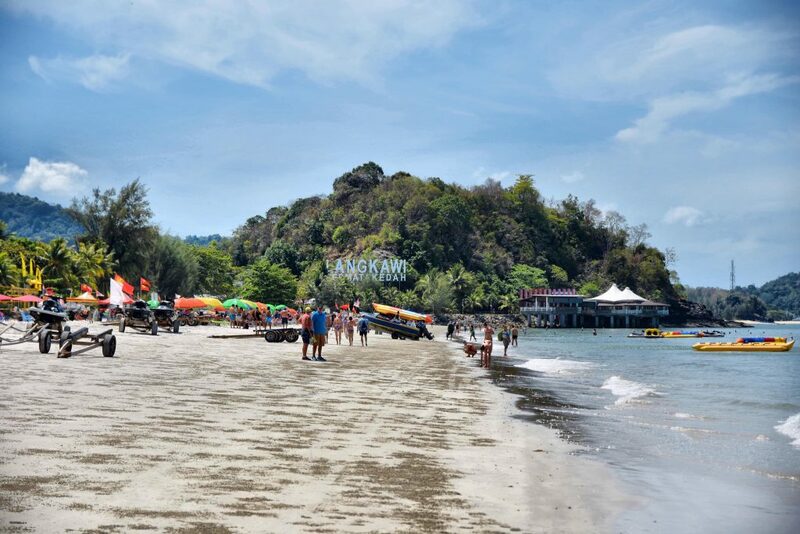 There is a lot to see in Langkawi, which has its main island surrounded by 99 islands in the Andaman some 30km off the main coast of Malaysia. The main attractions on the large island are the world’s steepest cable car to the top of the Machinchang Cambrian Geoforest Park, the Kilim Karst Geoforest Park and the town of Kuah, with its grand Eagle Statue and boat trips to the various islands. As it was crew drill day, all the excursions were gone by the time I was free and able to get out, so it was a shuttle bus ride to the nearest town of Pantai Cenang and a stroll along the beach with Grace that filled the rest of my day. 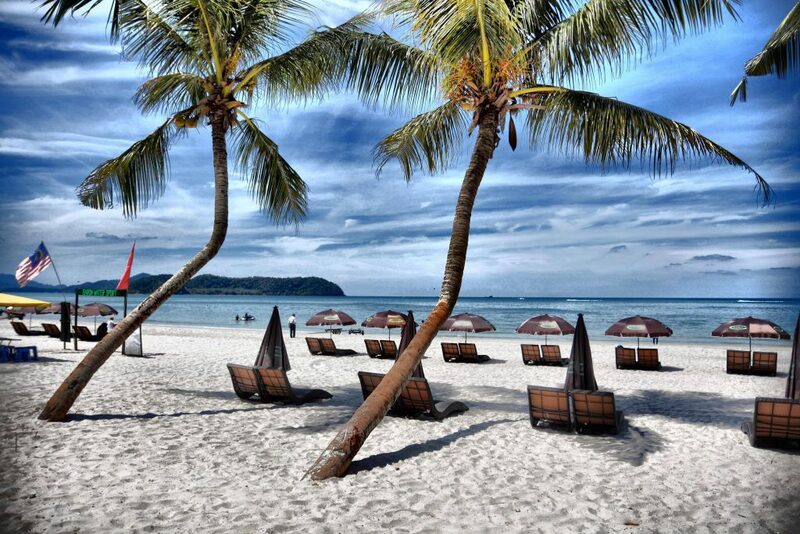 Pantai Cenang is a very laid back town on the western coast of Langkawi and close to the international airport, making it the main hotel zone of the island. Being a tax free island, it is also very popular with domestic tourists as well, and the shuttle bus dropped off right next to a large duty free shopping complex. This was also attached to another major Langkawi attraction, Underwater World, one of the largest marine and fresh water aquaria in South East Asia. This area was also a perfect drop off location for those people who just wanted a chill out day at the beach, with the lovely white 2km stretch in front of Pantai Cenang only a few hundred metres away. As the beach was so long and also very wide, it was not crowded at all and there was plenty of space for people to lay out on sun loungers. After all the exploits of the previous week, it was actually nice to take some time to just chill out and not do anything too taxing. The Sub Continent was next and two new countries for me to tick off the list and with less than a month to go on our world voyage, the end of a dream journey was insight. I have a few friends who have visited Sri Lanka on holiday and spent a long time exploring the length of this tear drop shaped tropical land. Sadly with a day visit it was not possible for me to get out and explore all of a country. I made the decision early on to explore the capital Colombo rather than take one of the full day trips further afield. 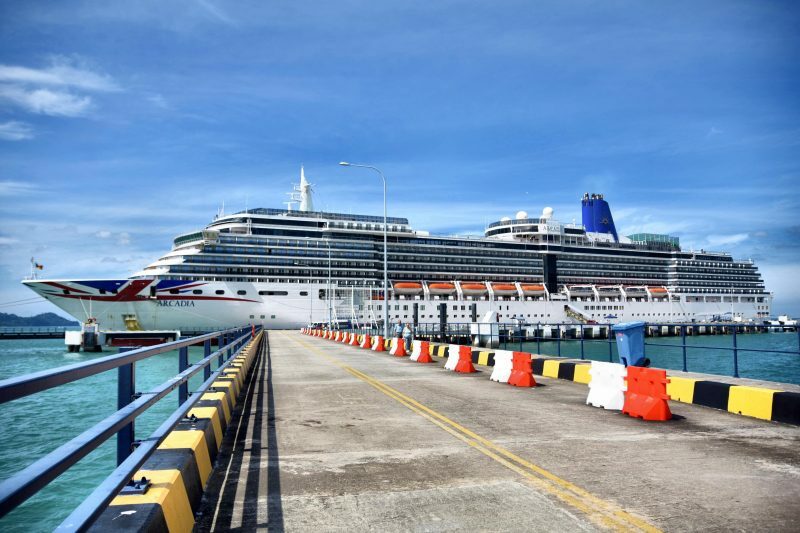 What is also important for me about knowing the docking location is that in future if I am to ever return to Colombo on a cruise ship, I can easily advise people now of what to see and do and how to go about doing it. As it was my first time visiting I did lots of research and had a good idea of what people would maybe wish to see, however I was not 100% certain how they could do this. Now I feel I could advise people quite comprehensively, as after the morning tours had been seen off my colleague Andy and I were taken around Colombo by our tour agency to give us a brief orientation before getting us back in time to see our guests off on their afternoon tours. I had no real expectations regarding Colombo, with many people telling me there was not much in the way of sights to see and that it was just a busy and dusty, fairly industrial city. To be fair that assessment is accurate to some degree. I mean the immediate view from the ship is of cranes and containers, as Colombo does not have a modern cruise terminal as yet. Colombo, with the help of foreign investment, is creating a huge tract of land, 660 acres in size, from sand dredged from the sea and brought in by trucks that will be create an area not to dissimilar to places like Dubai. Tentatively called the Colombo International Finance City, it will contain huge new multiuse towers, new shopping complexes, new marinas, health care facilities, schools and whatever else the Sri Lankan government can attract to the area. Hidden amongst all this new construction is where you can find elements of the old colonial city. Sights that you can see in the Fort area of Colombo which is the closest area to the port include the Old Lighthouse, opened in 1857, the Presidents House, home to the British governor from 1804 until 1948 and independence, and the general post office building opposite it. There is also a lovely little leisure complex at the Old Dutch Hospital which is well worth a visit and where we had lunch, which I highly recommend. A very simple building, the Old Dutch Hospital is formed of various rooms now converted into different businesses around a central courtyard. These businesses include souvenir shops and restaurants, of which one is ranked as one of Asia’s top 50 restaurants for 2018. Ministry of Crab is a seafood lover’s dream and is hugely popular amongst the local population, so much so that we were told we would not be able to get a table. As we were only needing a quick lunch we managed to be squeezed in and it was a not a disappointment. 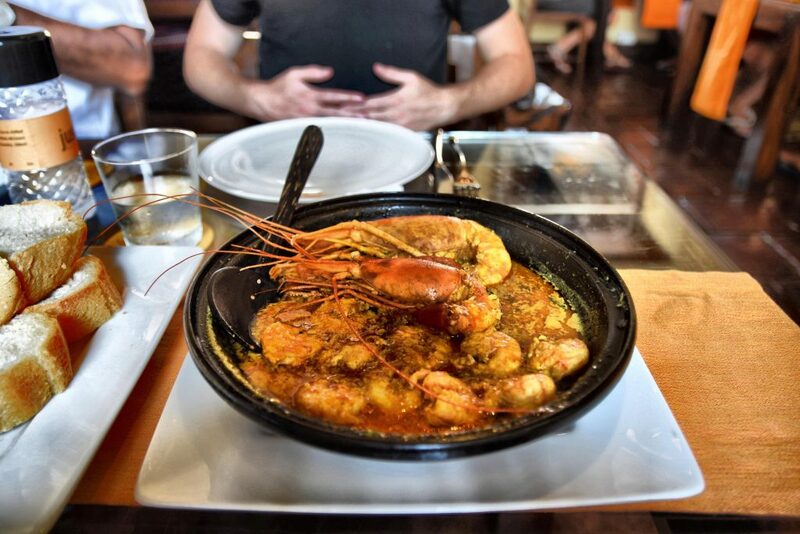 The menu is simple, with crab and jumbo prawns being the main dishes and the focus. The thing that makes this restaurant extra popular, is that it is backed by two of Sri Lanka’s famous sports stars, the cricketers Kumar Sangakarra and Mahela Jayawardene, whose portraits adorn the walls; so a restaurant for foodies and cricket fans alike if in Colombo. The main place that we visited on our short trip out was in fact one of Colombo’s oldest and most important Buddhist temples. 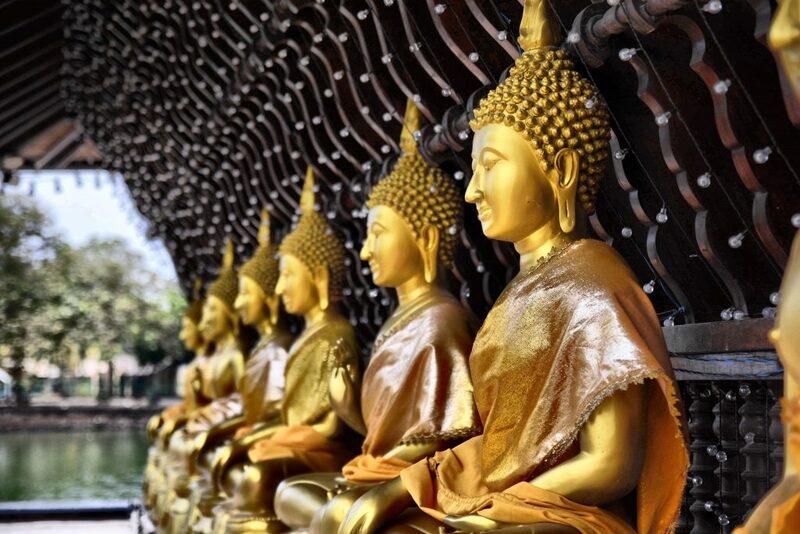 Gangaramaya Temple was opened in the late 19thcentury and has several imposing buildings, including a Vihara (temple), the Cetiya (Pagada) the Bodhitree, the Vihara Mandiraya, the Seema malaka (assembly hall for monks) and the Relic Chamber. You enter inside the Vihara first and find it is brilliantly and vibrantly painted and sculpted with various Buddha statues indicating events specific to his life and teachings. In addition to the main temple there is the Seema malaka, constructed out over the Beira Lake just a short walk from the entrance to Gangaramaya. It is mainly used for meditation and rest and the current area was rebuilt in the 1970s after the original from the 19thcentury slowly sank into the lake. For all the talk of Colombo not being an interesting place and people saying you should head out of the city, I was actually pleasantly surprised with the areas I visited, especially the temple and the Old Dutch Hospital. Today was a first for both Arcadia and I as we arrived into our only stop in India and the beautiful region of Goa. 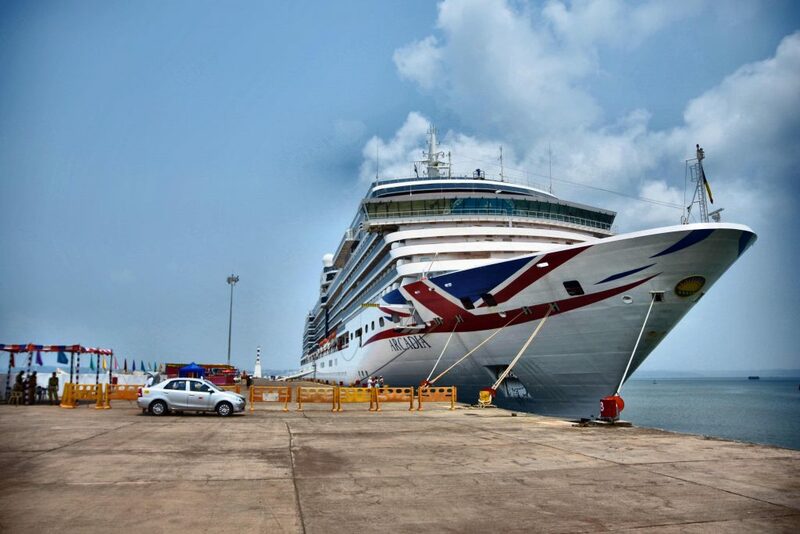 What I would say to people who are looking to cruise to the region is that the area you dock in, Mormugao, is a large, fairly industrial city and therefore not the beauty that you see in all the media of palm fringed beaches and bright colourful markets. That is all out there but you have to travel to do it, whether that be on an excursion or independent transport. The other thing I would mention is the heat; by around 8:00AM it was already a scorcher, with the temperature on my phone showing almost 33 degrees and rising. You need to make sure that you have plenty of water and sun protection and keep hydrated throughout the day. The humidity is what gets you and I was sure by the end of it that I had lost a few pounds just in the amount of sweat that had poured off me. As this was our maiden call to Mormugao, we were treated to a welcoming committee of traditional Goan dancers and musicians, and it was nice to see a lot of our fellow Indian crew members being given extra time off to go and see their loved ones, just like how our Filipino crew had been able to do in Manila. We were lucky enough today to venture out to visit the most historical area of Goa, the basilicas of Old Goa. Goa itself has a long history, with its more recent history being that of colonial occupation by the Portuguese for over 400 years. 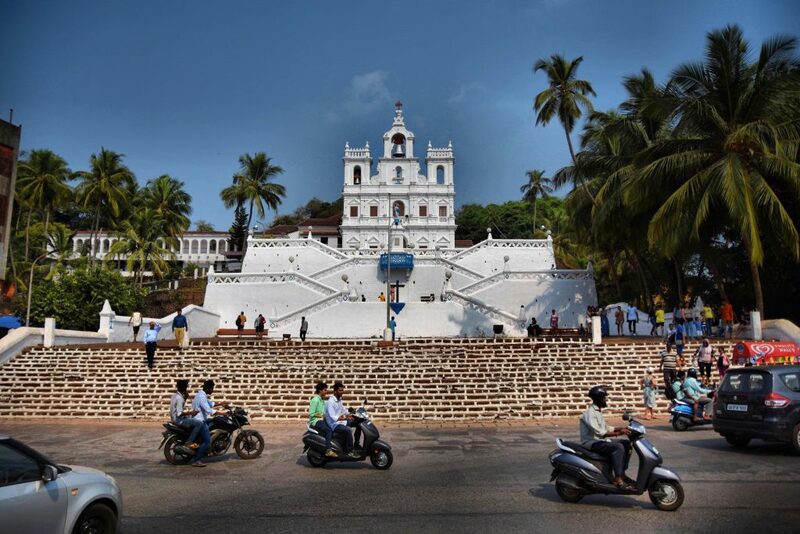 The Basilicas of Old Goa are a UNESCO World Heritage Site and we headed there with excitement as I was told by fellow crew members from Goa that it was the main thing I should check out whilst here for the day. Beaches are all over they said, but these churches are not. 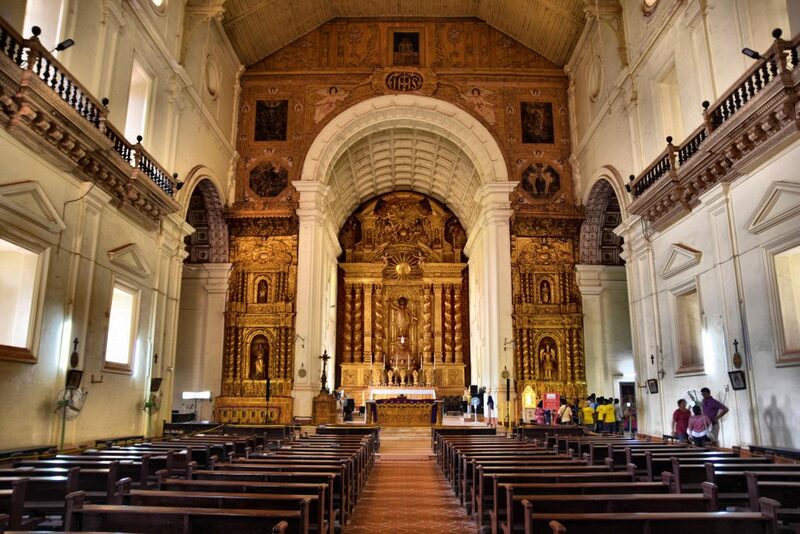 Amongst the remains are four key buildings that you should check out if visiting: the Basilica of Bom Jesus, the Church of St. Francis of Assisi, the Se Cathedral and the Church of St. Catejan. We had internal visits of two of these starting with the Basilica of Bom Jesus. Constructed between 1594 and 1605, this church has a special place amongst Goans as a pilgrimage site to visit the body of St. Francis Xavier. The second church we visited inside was the Se Cathedral, the seat of the Patriarch of the East Indies and the mother church of the Catholic Archdiocese of Goa. The architecture of this church is very similar to ones you can find in Lisbon, due to its Manueline style which is atypical of some of the famous Portuguese capital buildings such as the Belem Tower and Jeronimos monastery. The church is 250 feet (76 m) in length and 181 feet (55 m) in breadth, with the tower standing 115 feet (35 metres) high. There were not as many people visiting this church, which made it a peaceful escape and a moment to reflect. After the visit of the churches we had a quick visit to Panjim, the capital of the Goan region. This city has some of the oldest Portuguese architecture in the area and special districts have been set up to preserve it. One of these is Fontainhas, which without a guide, would have been very hard to find as a warren of side streets hiding the most picturesque street scenes that could be straight out of Portugal. We also got to see the Church of Our Lady, which towers over the city and is easily recognizable due to its two tone white and blue colour scheme. It is positioned at the end of the Municipal Garden, or Church Square, which is a tree lined boulevard where tuk-tuks and mopeds whizz by you without a care in the world, and you find little souvenir shops and tea shops on the side streets. As this was my only visit to India thus far, I feel that there is so much more to see and maybe next time I visit I will branch out further, maybe even try and take the overland to the Taj Mahal which my colleague Andy did this time and said was out of this world. But Goa was an experience and I was glad I had been able to go off and appreciate it more. Now for a little bit of a break as we had 3 sea days until we arrived in Dubai and the start of our final leg of an amazing world cruise. 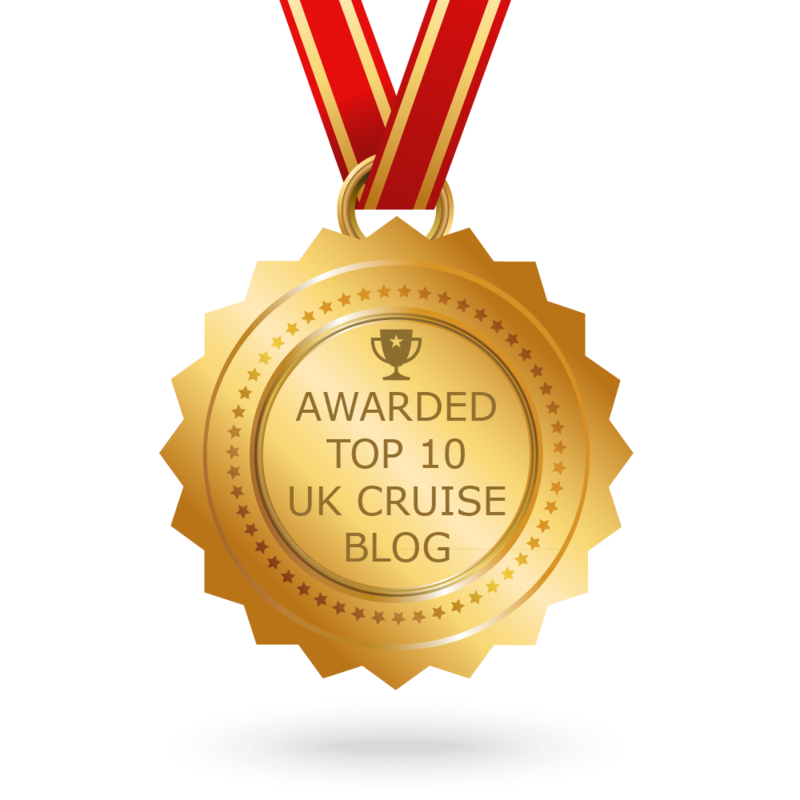 I am delighted to inform you that this blog has been featured in Feedspot’s Top 10 UK Cruise Blogs list. You can read the full list here.